One of my favorite genres and one that is the easiest for me to push aside is middle grade fiction. This year to make sure I get a little more children's and young adult fiction I thought I would designate the first Monday of every month Middle Grade Monday. While a lot of my picks this year are classics I am trying to branch out a little bit and read new or at least recent releases. 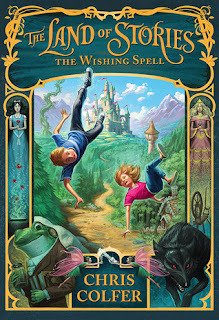 This month's book is one that has been on my radar since it first came out a few years ago - The Wishing Spell, the first book in The Land of Stories series by Chris Colfer. Life for twins, Alex and Connor Bailey has been difficult this past year with the loss of their father, their home, and the way their family used to be. Connor is struggling to get through school and while Alex is excelling academically she's struggling to fit in. When their grandmother visits bringing her beloved book, The Land of Stories, things take a dramatic turn and soon Alex and Connor find themselves battling goblins, wolves, and witches as they try and get home. This one has been on my radar for quite some time because of the cover. I love the castle in the back and just the whole fairy tale look of it. Then when my son's school librarian recommended it one day when we were talking about books I knew it was time. to actually read it. And for the most part I loved it. The characters are twelve and they read like twelve year olds. They're loyal to each other even though they drive each other crazy at times like normal siblings. I liked that both Alex and Connor had their strengths and weaknesses and those tend to compliment each other. The setting is amazing. I mean it's The Land of Stories with Rapunzel's tower and Cinderella's castle looming in the background. All through the journey the twins meet with a whole cast of familiar characters- Cinderella, Goldilocks, Snow White, wolves, frog people, and anyone else you've ever bumped into while reading fairy tales. The book did a good job of walking the line between the Disney fairy tales and the original Grimm's Brothers. These aren't sweet characters holding hands and seeing campfire songs after their story is finished. They're got attitude (some more than others) and their own sorrows and drama. But at the same time they're not quite as gruesome and vengeful as the originals. I think this would be a great read for 8 and up. There's a bit of danger but it wasn't scary (think 1st Harry Potter level) even for more sensitive kids. My only real issue with the book was that I felt like it was a bit too long. It clocks in at over 400 pages and there were times I felt it dragged a bit or was over-detailed. If it had been 100 pages shorter I would have loved it. However, overall I found it an enjoyable read that fairy tale lovers of all ages will enjoy. I agree it sounds like 8 & up group would love this book. 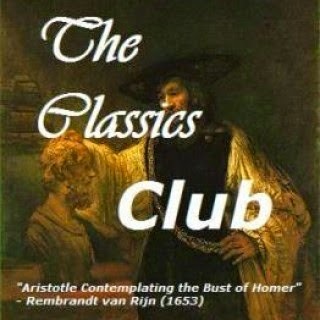 I love the cover and thanks for sharing. These books are so popular at the library! Kids love them. I haven't read them, but I'm glad you enjoyed it. I always get a kick out of the fact that actor Chris Colfer writes these books. I really want to give one this one a try. Not only does it sound good, but I like Chris Colfer. So it is an added bonus that he writes well too. I heard this Glee star was really good as an author and that this series was highly popular. Sounds good, but I agree, I don't know what's up with these gargantuan Middle Grades. People will say, oh but Harry Potter... but I feel only the first HP book was solidly MG, the really long ones were YA.